Tomorrow, The Warriors take on Congo Brazzaville on Sunday in a decisive Afcon Qualifier. The game will be played at National Sports Stadium in Harare. 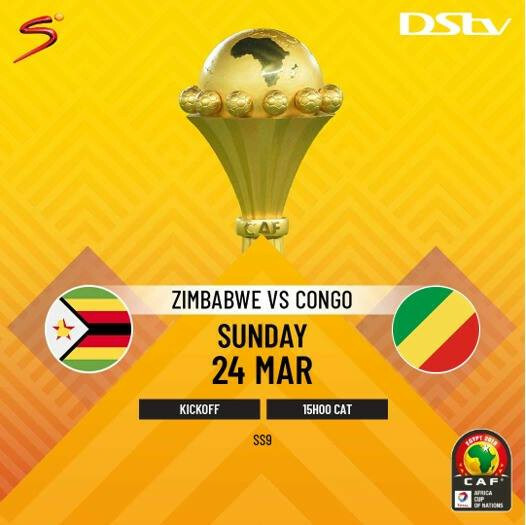 For those that are unable to travel to the National Sports to watch the game, they can watch it at home on DStv SuperSport 9 which will be screening the game live at 15:00hrs. Warriors coach Sunday Chidzambwa today announced the final squad. Edmore Sibanda (Wibank Spurs, SA). Ronald Pfumbidzai (B. Celtic, SA). Abbas Amidu (Arar, Saudi Arabia). May the Grace and Mercy of Our Ever-loving and living God of favour the God of Abraham be upon you warriors in the Mighty Name of Jesus Christ the Nazarene.